The Goodwood Festival of speed this month will see the UK debut of the Lexus LC 500, a beautiful V8-powered two-door that the company calls a ‘luxury coupé’. It’s due to go on sale in spring 2017 with a likely price tag of £90,000. The LC started life in 2012 as a dramatic concept car called the LF-LC, shown at the Detroit Motor Show. 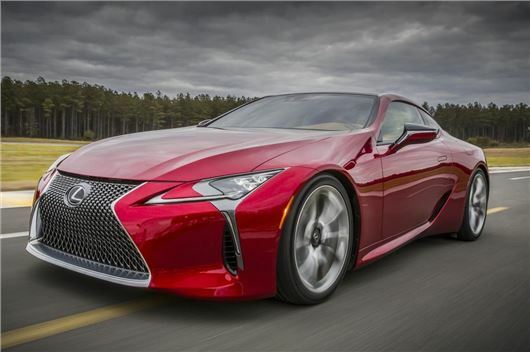 Although there were no plans to produce it at the time, so said Lexus, the company changed its collective mind after the response was overwhelmingly positive. The production version is hardly less dramatic than the concept, with supercar-like proportions and a 475PS V8 engine driving the rear wheels through a ten-speed automatic gearbox. This is the only version that will go on sale (to start with at least), so no diesel or hybrid – and no chance of exceeding 30mpg. A 2+2 layout means there’s a small pair of rear seats, making this a rival to the Porsche 911 despite being slightly bigger than the ubiquitous German sports car – and no doubt more comfortable. The cabin is plush, with most surfaces swathed in leather and the model due to be the first equipped with a new multimedia system. And hopefully a less baffling one than the point-and-click setup in today's Lexus models. The Goodwood debut, on Thursday June 23, will see the LC 500 driven up the hill climb course as well as being on static display alongside the LFA supercar, RC300h coupé and NX300h.